Quarterback Patrick O’Brien completed a 25-yard touchdown to Keyon West for the go-ahead score with 42 seconds left, sending the Catawba Indians past the VMI Keydets, 27-20, in football action Saturday at Foster Stadium in Lexington. After the teams had traded scores for the first 14 minutes of the final quarter and Quan Myers had tied the game with a 26-yard touchdown run for VMI (0-2), O’Brien orchestrated a seven-play, 65-yard drive that started with 3:21 on the clock. The quarterback went 3 for 3, two of the completions going to West, including the eventual game-winning touchdown. Catawba (2-0) still had to hold VMI for the final 42 seconds, but Kyle Kitchens forced an Austin Coulling fumble on VMI’s second play of the ensuing drive. Cole Brummit recovered, but Coulling was intercepted by Jeremy Addison on the very next play to seal the Indians’ upset win. The visitors and Keydets played a fairly even game statistically, but Catawba was able to convert on 7 of 15 third downs to just 3 of 16 for VMI. 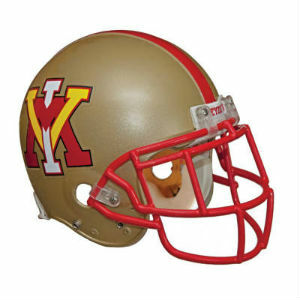 VMI did post 180 yards rushing – 126 of which were gained by Daz Palmer in 29 carries. Catawba’s Sam Mobley made eight catches for 211 yards and a touchdown. From a quarterbacking perspective, Coulling went 15 of 34 for 199 yards, while O’Brien relieved in the second quarter and was an impressive 12 of 19 for 261 yards and two scores. The Keydets jumped ahead early, when Palmer scampered 56 yards for a touchdown less than three minutes into the game. Grant Clemons tacked on a second-quarter field goal, and it was 10-0 at halftime. The first half saw Catawba held to just 98 total yards, and the Indians spent just seven plays on VMI’s end of the field. That changed on the Indians’ second drive of the third quarter, when two long passes to Sam Mobley – completions of 36 and 42 yards – set up a one-yard plunge by Eamon Smart that made it 10-7. That would be the score entering a wild fourth quarter, which began with an Indian drive that saw Kenyatta Greene score from 28 yards out. After a missed point-after, it was 13-10 with 13:26 to play. Clemons tied the game with a 39-yard field goal less than two minutes later, a kick set up by a 39-yard Coulling to Palmer pass play, and it was 13-13. It took just 1:25 for Catawba to tie it, as Mobley bookended an 81-yard drive with a 66-yard grab and a 13-yard touchdown reception. Just like that, it was 20-13, but VMI came right back once more. This time, it was a Rohan Martin 26-yard run and a Coulling-to-Alex Ramsey 30-yard pass play that set up Myers’ 26-yard TD run with 7:32 on the clock. That tied the game, 20-20, and after an exchange of punts, set up the game-winning drive. VMI football will return to action Sept. 16, when the Keydets take on Robert Morris in Moon Township, Pa. Action gets underway at 3 p.m.